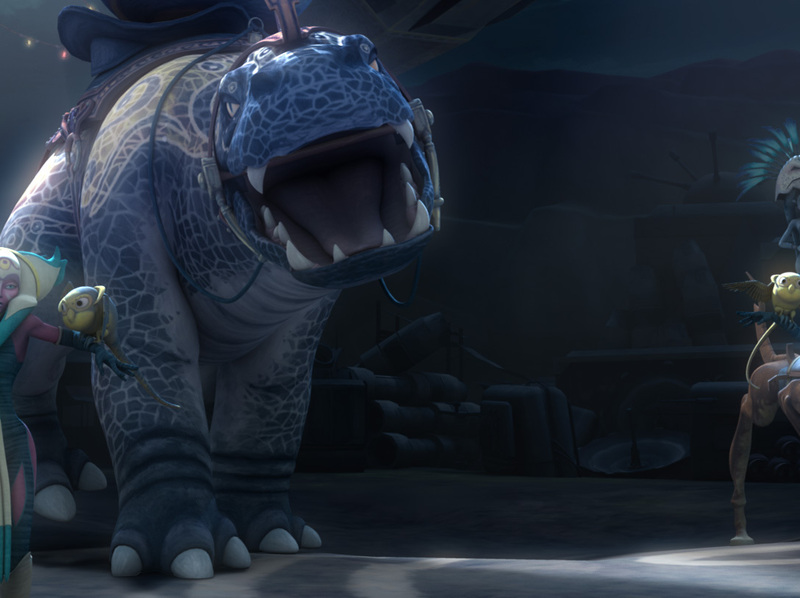 Season Four of The Clone Wars unearths some of the most exciting creatures in Star Wars. The “Battle of Mon Cala” arc is a “shocking” experience as we meet giant electric eels and jelly fish of the deep sea. 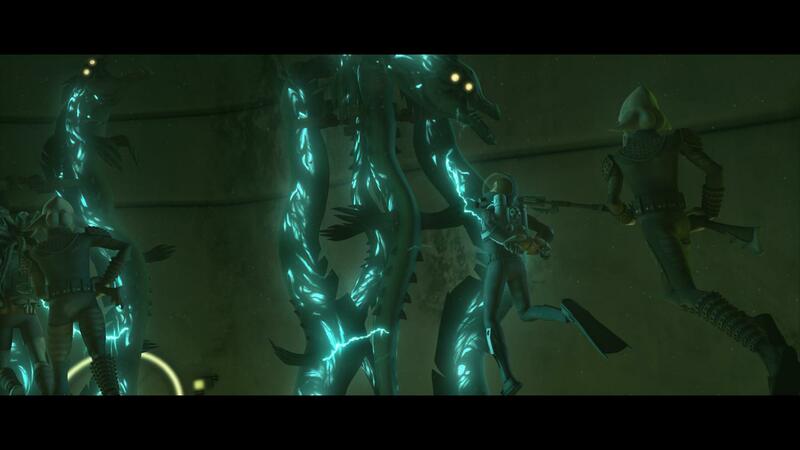 In the “Darkened World of Umbara” story arc, bioluminescent beasts drag us into their gaping jaws and swallow us hole. During the “Slaves of Zygerria” arc we are nearly eviscerated by an exotic pet before we fly the skies on the backs of giant lizards. On Zygerria we also see a few familiar beasts like blurrgs, Kiros birds, momongs, and monkey-lizards. Below we share some of the best monsters and beasts from the season. 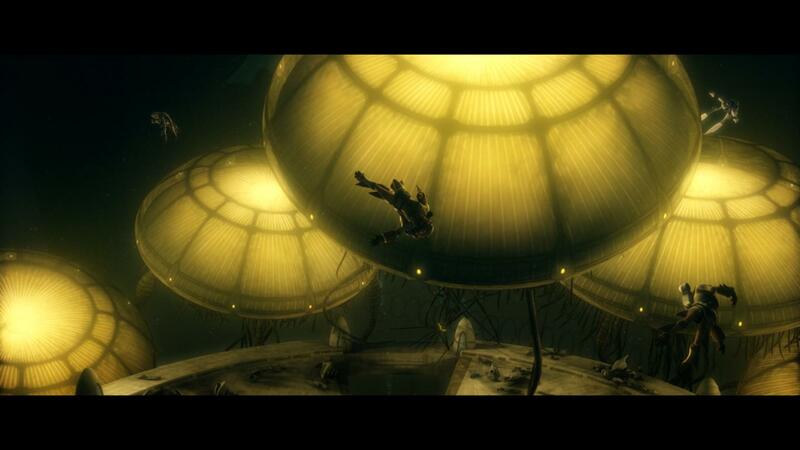 Hydroid medusas are enormous cybernetic jellyfish bioengineered by the Karkarodon Commander, Riff Tamson. The freaks of science and technology aid him in his conquest of Mon Cala for Count Dooku and the Separatists. They idea of a cyborg jelly monster might sound more comical than threatening at first (until you see them), but these electrified behemoths are large enough to carry their own power plants, and virtually impervious to the weapons of the Republic and Mon Calamari. Worse still, they shock and kill every living thing that they came in contact with. 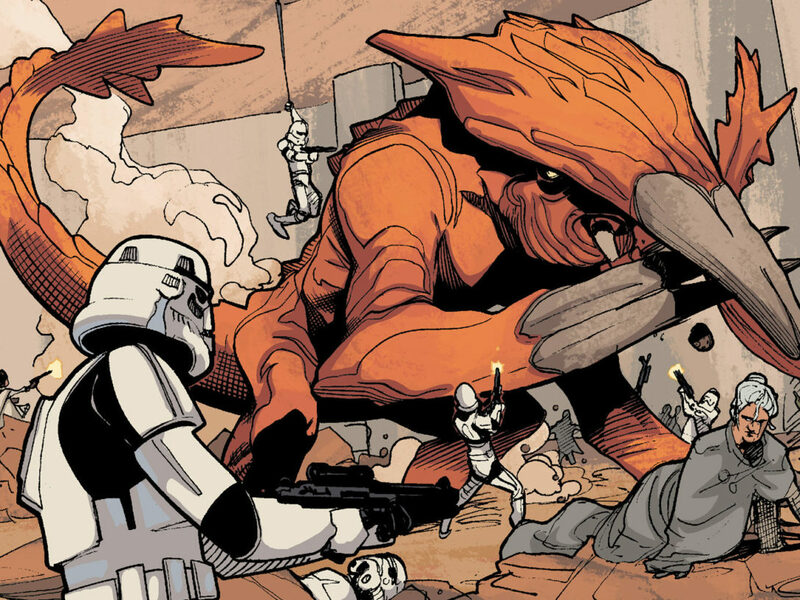 Thankfully the Gungan army comes to the rescue, proving their merit when their booma weapons short-circuit these mindless but deadly creatures. These tentacled menaces were designed by artist Darren Marshall and are seen in “Water War” (S401), “Gungan Attack” (S402) , and “Prisoners” (S403). Electric eels are nasty creatures from the deep sea caverns of Mon Cala. They have four eyes and a pronounced under bite full of fangs, which are continually replaced as they are worn off. Riff Tamson and his Quarren allies place the eels in binders to form a cage and torture device where they hold Anakin Skywalker and Kit Fisto. The electric eel cages were requested by George Lucas to offer something unique in comparison to the other way’s we’ve seen Jedi restrained (usually in some sort of energy field). 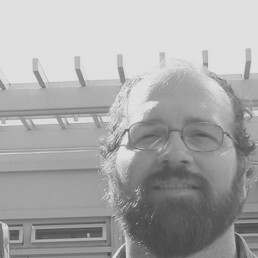 The eels were designed by artist C. Sanchez and can only be seen in the episode “Prisoners” (S403). R2-D2 and C-3PO encounter hesten monkeys during their adventures on Balnab. The blue, white, and black creatures have six limbs and a prehensile tail. Hestens are social animals and live in troops of extended families. These beautiful animals are actually a little bit out of place on Balnab, since the other indigenous life forms on planet are relatively primitive by comparison. It is likely that the monkeys are marooned there — perhaps they were once captives on a ship that crashed on Balnab — much like the shipwrecked alien race that now hunts them there. 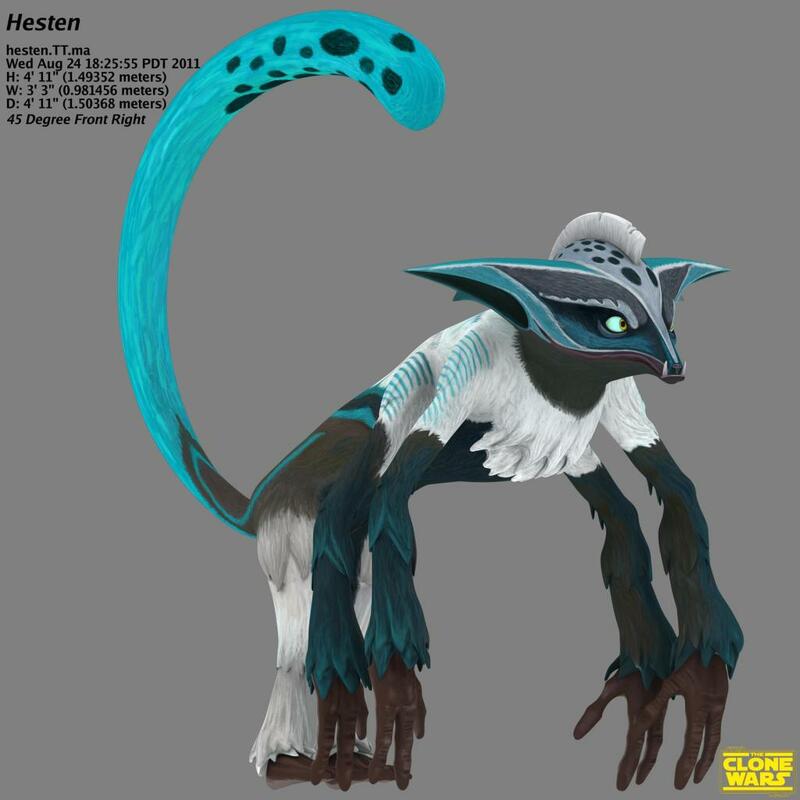 Hestens were designed by Tara Rueping and closely based on the momongs of Wasskah, first seen in Season Three. They are not merely a repaint of the same digital asset, however. Their ears are quite different from a momong — smaller and extending outward. Their behaviour and vocalizations are unique as well. Hestens are named such because they are hunted by aliens riding tee-muss who catch them in nets, much like the horse-riding apes hunted Charles Hesten in Planet of the Apes. Wild hesten monkeys are seen in “Nomad Droids” (406), and as pets of the Zygerrian slaver, Darts D’Nar, in “Kidnapped” (411). In the endless nights of Umbara, a nightmare waits for prey among the weeds. A vixus is a bit like a cross between a man-eating octopus and a garden cabbage. 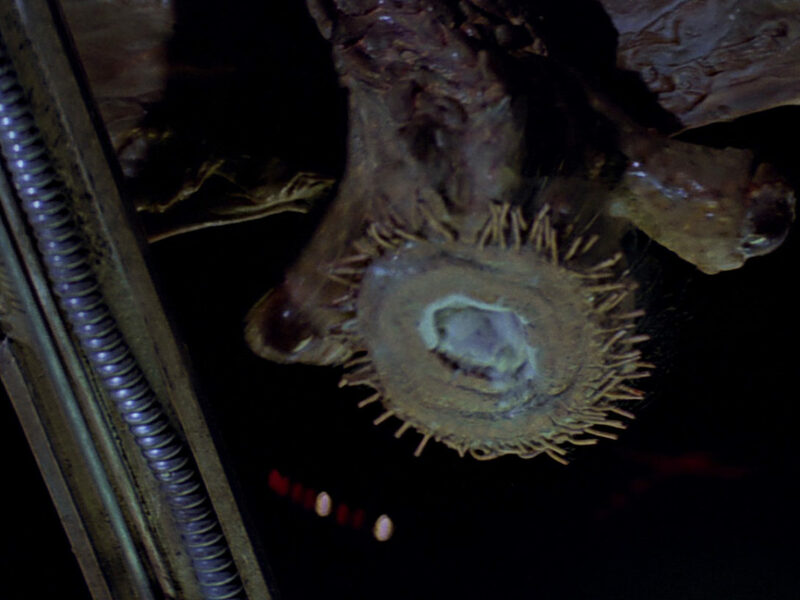 Or perhaps a Sarlacc is a more relatable comparison. 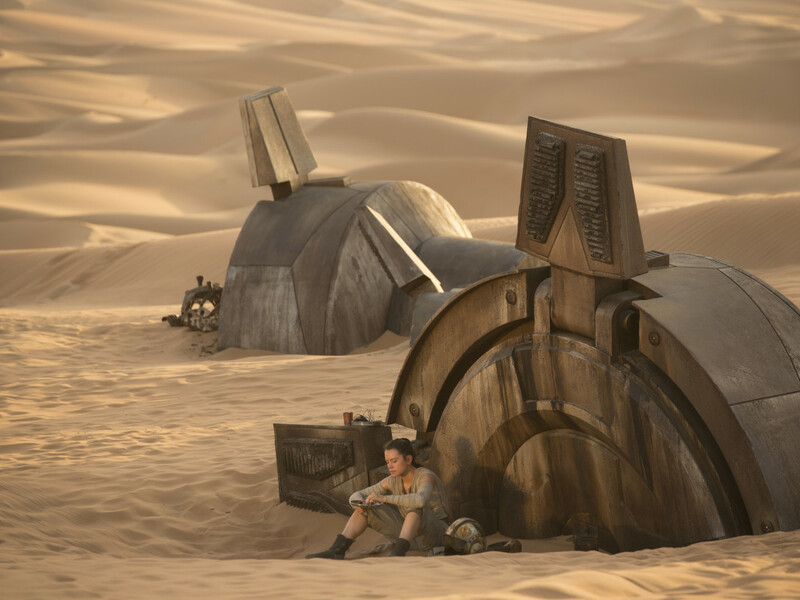 The vixus isn’t your father’s Sarlacc though. Vixus (or perhaps vixuses, or vixi) feel vibrations through a network of small, vine-like tentacles and underground roots. Unlike a Sarlacc, the vixus is not a passive eater. 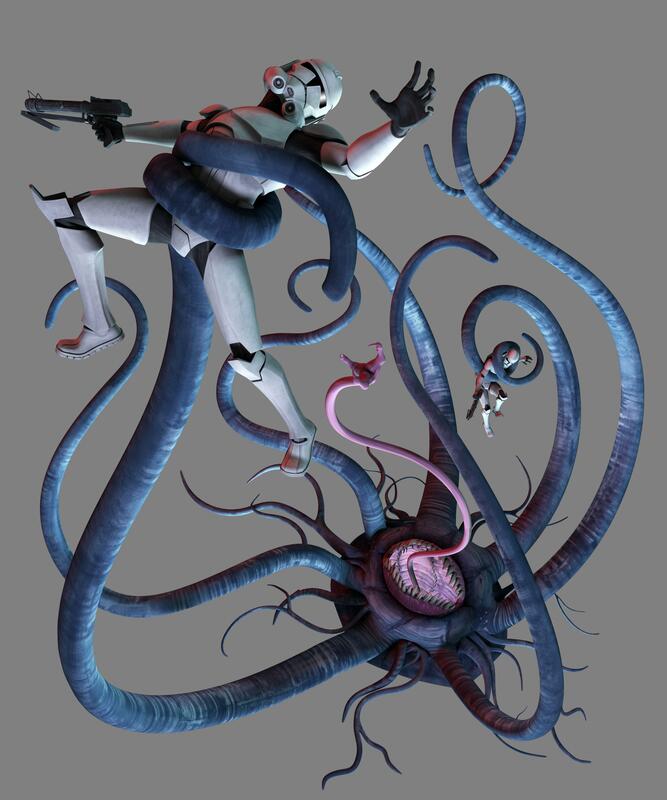 When unsuspecting prey — or in our case, clone troopers — come near, the vixus grabs them aggressively with one of seven long blue tentacles. It may pass off it’s food to a long beaked tongue, before it pulls it toward it glowing mouth. As a clone pass mesmerized into it’s subterranean glowing gullet, toothy jaws close behind him, locking tightly. Unlike a Sarlacc, the violent digestive process of a vixus doesn’t take very long. The design team at Lucasfilm Animation looked to creatures like the “Kraken” in Pirates of the Caribbean and the “Watcher” in Lord of the Rings for inspiration in developing the Vixus. The creature concept was designed by Will Nichols and the final monster is encountered in both “Darkness on Umbara” (S407), and “Carnage of Krell” (S410). 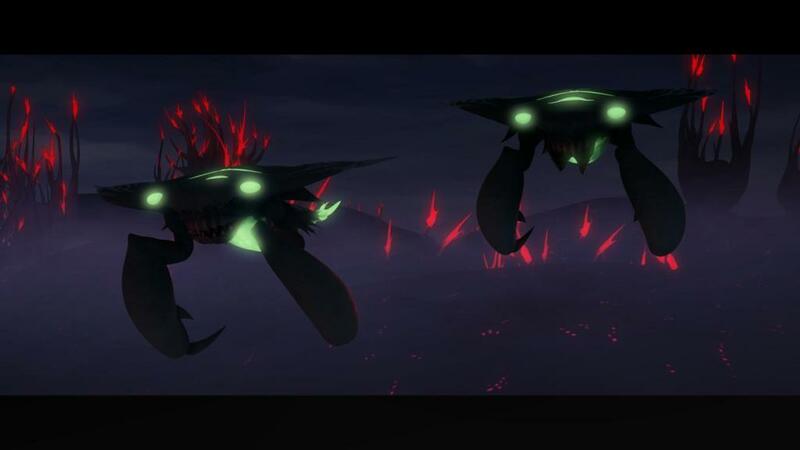 Banshees are large, winged predators also found on Umbara. 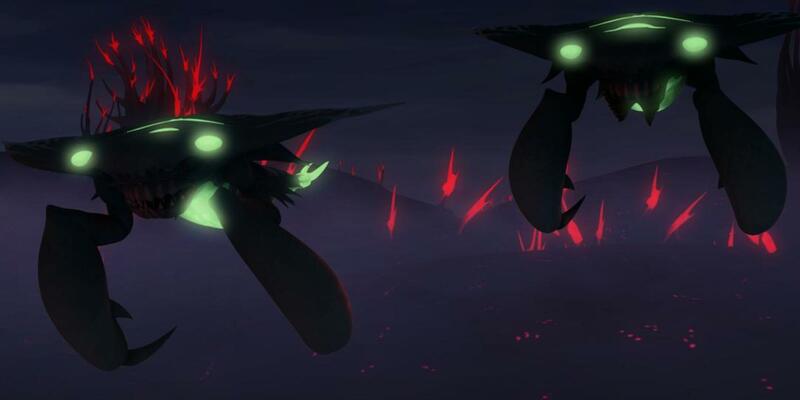 Like many life forms that thrive in Umbara’s endless nights, banshees are bioluminescent, emitting patches of ghostly green light from their emotionless eyes and a glowing strip down their belly and drooping tail. They have fleshy wings like the tibidees of Stygeon Prime, but crustacean-like claws and a long segmented tail. Banshees are social animals and hunt in pairs or small packs. These voracious predators attack the clone armies on their way to the capital city, carrying some of the clones off and feeding on the fallen. They have a grisly set of extendible inner jaws (think the movie Alien) to chew apart their prey. Banshees were designed by artist Polina Hristova, and appear in “Darkness on Umbara” (S407), “The General” (408), and “Carnage of Krell” (S410). 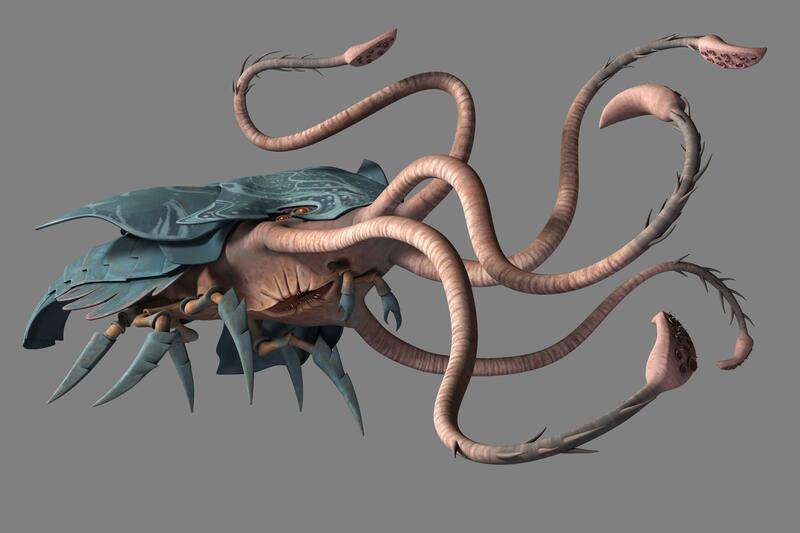 The blixus, not to be confused with the vixus on Umbara, looks a bit like a cross between a blue horseshoe crab and a giant pink squid, and was designed by artist David Le Merrer. Anakin Skywalker encounters a caged blixus at the back of a Zygerrian slave vessel owned by Captain Oryx. Sadly, Anakin is forced to kill the beast ,who is clearly held against his will and just trying to have a quick bite to eat. The blixus is a rare creature, highly prized by wealthy collectors of exotic pets and animal trophies. 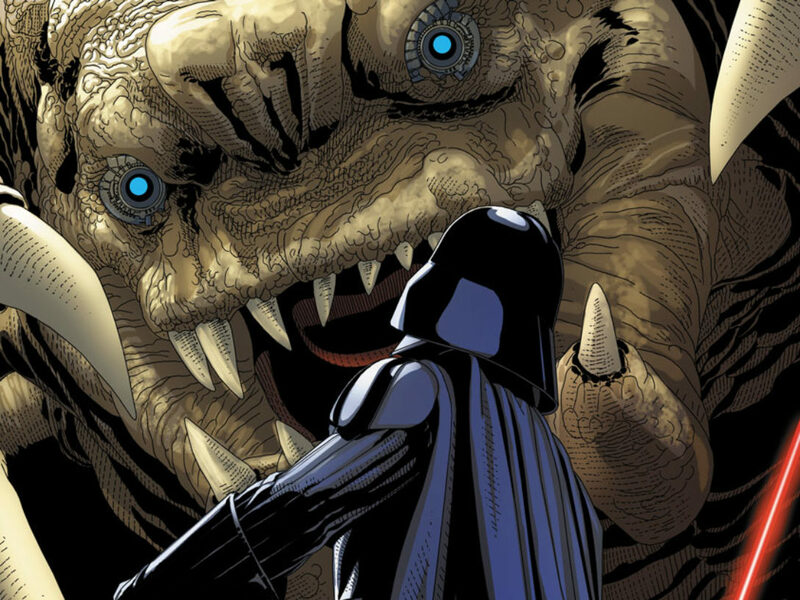 Jabba the Hutt would surely love such a creature for his dungeon arena. Blixus are partly covered by a hinged protective shell made of chitin. Its six sharp legs can stab prey much like an acklay. Five long tentacles at it’s front grab food items (like clone soldiers) with hooked suckers on the end of its pads. Then they pull their food, screams and trashes about, up to little pincers above it’s mouth. There the blixus pulls its meal apart and stuffs tasty morsels, bite by bite, into it’s toothy, cavernous mouth. 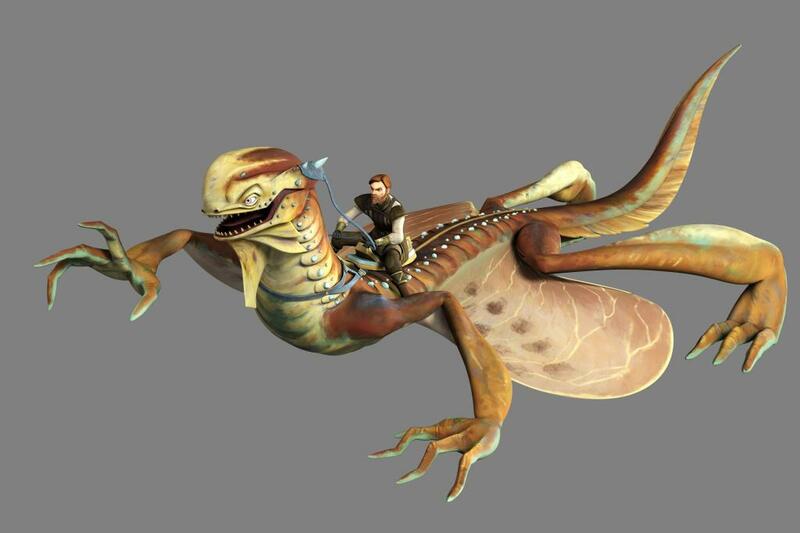 It’s unfortunate that we don’t see much of the blixus in “Kidnapped” (S411), because it is definitely one of the most unusual monsters developed for The Clone Wars. Brezaks are giant flying lizards used as transportation by the elite of Zygerria. The graceful reptiles have skin flaps extending from their front to hind legs and anchored to their rib cage, which allows them to glide long distances. Their tail acts as a rudder, giving them a great deal of directional control. These carnivorous, rust-colored lizards camouflage easily in Zygerria’s rocky orange terrain. 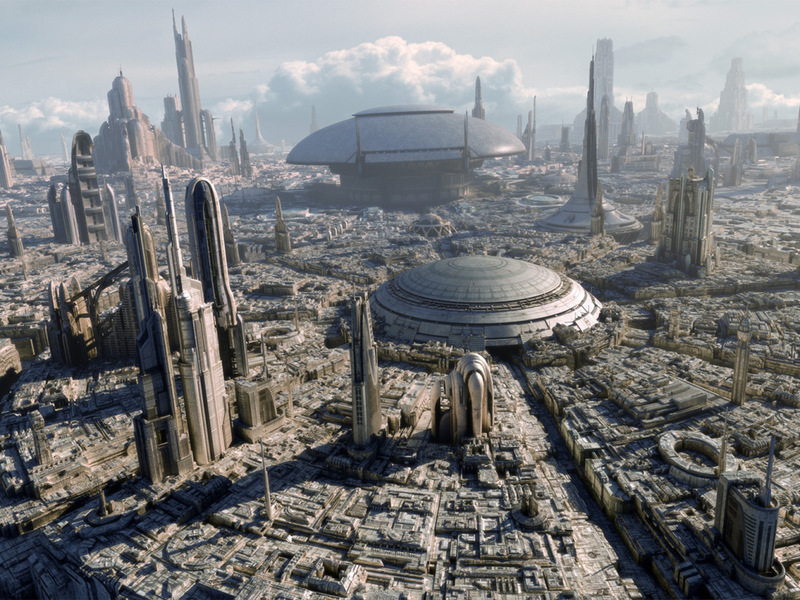 Brezaks first appeared in the comic series, The Clone Wars: Slaves of the Republic, written by Henry Gilroy, and were adapted by Lucasfilm artist Randy Bantog for the episode “Slaves of the Republic” (S412).